Building a modern data center infrastructure requires simple and fast deployment with flexibility and scalability to fulfill dynamic changes at the edge. A one-stop-shop solution for data center facilities not only reduces cloud computing development time, but also helps business growth to quickly reflect customer demands. Quanta Cloud Technology (QCT) hyperconverged solutions integrate compute, storage, and networking technology to provide highly simplified cloud deployment and management. Data center networks have evolved very quickly in the past few years because of mobility, big data, and cloud computing factors. A diverse number of application and innovation requirements have caused traditional Ethernet switches with an embedded network operating systems (NOS) to become less practical as hyperscale data center networks grow. Embedded NOS with proprietary features impede networking scalability and business growth. Due to these factors, traditional ethernet switches require deconstruction and software/hardware disaggregation. Via this change, the Bare Metal Switch (BMS) has also become more standardized to support multiple NOS and applications. Utilization is needed to install multiple NOS in the network to reflect flexibility. Open Network Installation Environment (ONIE) is an advanced boot loader pre-loaded in the BMS Ethernet switch to support NOS installations in the network. With proper NOS installation, an Ethernet switch also requires a proper network configuration. The BMS with QCT NOS (QNOS) installed can have configurations auto-install in hyperscale deployments. From SDN, virtualization, optimization of data forwarding, to network automation; traditional network NOS can’t keep up with the changing demands of data center networking. A diversity of NOS installations for different applications is required in order to meet market requirements. 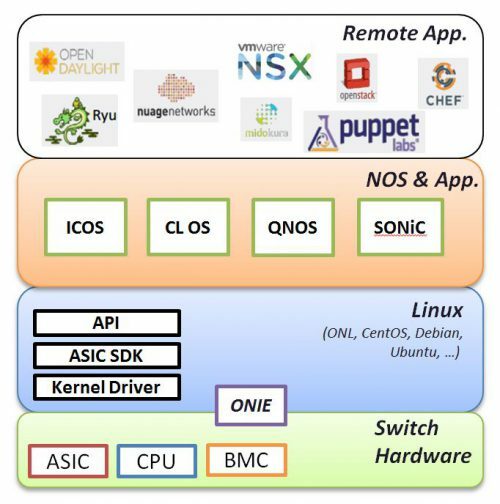 The below figure provides a clear structure for an open switch hardware structure and the components inside including multiple NOS choices and multiple applications. QCT BMS Ethernet switches are pre-loaded with ONIE for multiple NOS installations. The installation can be performed from the out-of-band management port to reach remote servers or from an USB dongle which stores the ONIE installer file. The ONIE install support protocols including FTP, TFTP and HTTP. The ONIE installation is executed when the devices boot without NOS. The device is by default in DHCP client mode and will discover the IP address from the DHCP server. Within the IP address lookup, the DHCP server also provides the FTP/TFTP/HTTP server IP and the information of the NOS file name. This information helps the device understand from where to find the file and from which file it needs to install the NOS. The figure below provides a clear picture of the ONIE installation flow. The OOB port in each BMS Ethernet switch (the black panel) connects with an aggregation management switch (the gray panel) and submits its DHCP discovery packet for IP address lookup. The management switch can bridge the discovery packet either in the same domain or cross domain to reach the DHCP server. The DHCP server will feedback not only the IP addresses the BMS switches need but also the proper protocols and NOS file name so that the device can automatically retrieve the NOS from the remote server and install them. QCT NOS (QNOS) supports ONIE installation and features rich L2/L3 functions including auto installation to perform network automation. The next section introduces the QNOS auto installation feature. After the ONIE installation with the QNOS is complete, the switch will successfully boot up without the start-up configuration. A network administrator can schedule a second boot for QNOS units to look for start-up files automatically. QNOS by default is auto installation enabled. Under these conditions, the Ethernet switch will automatically look for the configuration file from the remote FTP/TFTP/HTTP server via the information the DHCP server provided. Once the start-up configuration is loaded into the switch with QNOS the switch is ready to be operated. QNOS also supports NOS updates via its auto installation method. Network administrators can remote telnet to the device and schedule a delete of the start-up file and reload. Once the device is booted again without a start-up file, the device will try to find the start-up file as well as the QNOS. The device will compare the QNOS image version and execute the QNOS update if a newer version is found from the remote FTP/TFTP/HTTP server. Once the QNOS is updated completely, the start-up file will be loaded as the previous paragraph described. Furthermore, the start-up configuration file auto installation requires no reload actions. Using this method, the QNOS update becomes simpler, smoother, faster for massive switch deployments. For more information download the datasheet.